Got this coffee table for a basement renovation that I am doing. I was going with a mid century modern theme and this fits in nicely. It was easy to put together, I did it myself as I do all of the things I buy online that need assembling. The only complaint is a slight wobble in the table even after I ensured all legs were tightened. I can't decide if its the floor (completely possible as its a basement) or the table. Regardless I am keeping it and just purchased some tabs for the bottom if it doesnt level out on the rug it will sit on. Form meets function. Designed by Angelo Surmelis, the Stratos Oval Coffee Table is a chic accent with lots of tabletop space for all your living room essentials. 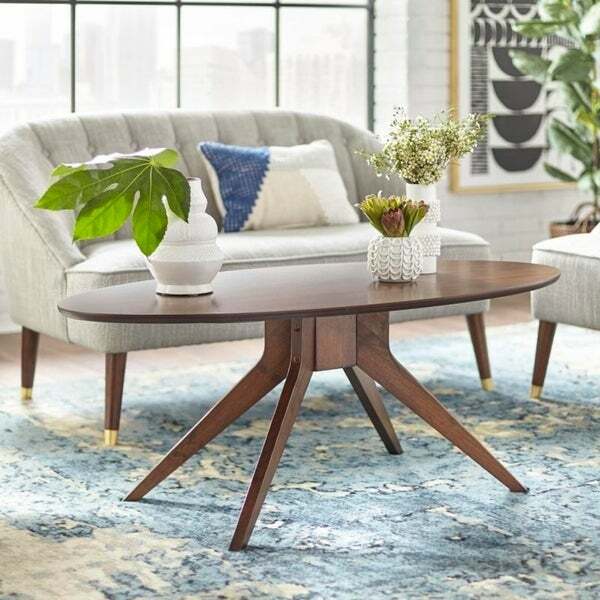 This striking table is inspired by Mid-Century modern designs with its angled legs and broad oval top. Crafted of sturdy wood legs and a veneered MDF top, the table features a deep Walnut finish that's easy to coordinate with other room colors.